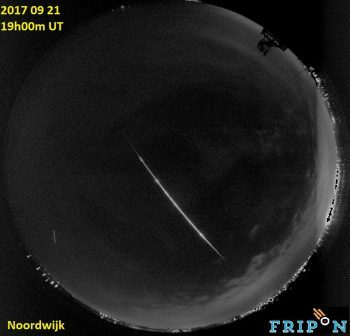 A bright fireball occurred over the Netherlands on 21 September 2017 at 19:00 UTC (21:00 CEST). In addition to many individual sightings, it was also recorded by an all-sky camera dedicated to recording exactly such events. The camera is part of the Fireball Recovery and InterPlanetary Observation (FRIPON) network (https://www.fripon.org), and is hosted on the roof of a building at ESA’s Estec technical centre in Noordwijk, the Netherlands. Other FRIPON cameras which recorded the event were located in Lille and Brussels. The combined data will allow to the object’s trajectory to be reconstructed. It is most likely that any resulting fragments – meteorites – will have fallen into the North Sea. Fireball sightings such as this can be reported to the International Meteor Organisation (http://www.imo.net) or to the American Meteor Society (http://www.amsmeteors.org). Reports for this particular fireball can be seen via https://www.amsmeteors.org/members/imo_view/event/2017/3301. Video credit: F. Colas/Paris Observatory/FRIPON team.